This content provides you with sample piping stress analysis Engineering Specification that is used in industrial plant construction works. This specification prescribes the basic requirements for stress analysis of the piping systems to be performed during the piping design work for use in industrial plant. The latest edition / version of the following codes, standards and specifications shall form a part of the requirements of this specifications. The piping stress analysis shall include the following loading effects as applicable. The weight load shall include the pipe weight, weight of content, insulation weight and weight of fittings and any inline equipment. For piping systems, which are tested hydraulically and have content with specific gravity less than 1.0, a hydro-test run shall be performed assuming a specific gravity of 1.0 to establish the structural design loads. Temperature to be used in the piping flexibility analysis shall be the maximum differential temperature between any of the following applicable conditions. 1) Maximum dry bulb temperature of 48°C shall be taken as the installation temperature for cold insulated piping service. 2) Minimum dry bulb temperature of 5°C shall be taken as the installation temperature for bare/hot insulated piping service. 1) Operating temperature as stipulated in the line list. 2) In addition, the following temperature condition shall be considered in the calculation when lines are specified in the line index. Steam out temperature: Normal steam out temperature should not exceed 120°C for saturated steam. This steam out temperature shall be considered only for flexibility purposes of hydrocarbon serviced lines. 3) For piping which normally have no flow (such as drains, start-up lines, etc.) the flow calculation temperature shall be determined as follows. For insulated piping, 75% of operating temperature shall be taken. For un-insulated piping, 25% of operating temperature shall be taken. For section between stand-by equipment and cut-off valve, installation temperature shall be taken. For piping which have warming-up by-pass, operating temperature shall be taken for all section. Maximum operating pressure and minimum vacuum pressure shall be taken as the calculation pressure as per ASME B31.3, unless otherwise specified. 3.4.1 Friction effects shall be considered in the design of anchor on horizontally long run piping system with OD larger than 8 inch. 3.4.2 Following friction factor shall be used for computing the frictional resistance. 3.5.1. Wind and earthquake effects shall be checked in formal computer analysis, if experienced stress engineers decide it necessary. Wind loading shall be considered for sizes 24NB and over, for heights more than 10 m above grade where not shielded. For earthquake loading the equivalent static force analysis method shall be applied. The wind load and Earthquake as acting separately in two lateral condition 90º apart. 2. 4.1. Piping to purged vessels that cannot be disconnected during purging shall be designed with sufficient flexibility to accommodate the thermal displacement of the vessel. 4.2. The use of cold spring in piping, which connects to rotating equipment, is prohibited. 4.3. If temperature, resulting in short term loading as those stated in Para. 3.2.2.2) is specified in the line list, thermal effect by this temperature shall also be considered in the analysis. However, the reaction loads at equipment shall not be taken from this alternate analysis case. 1) The required flexibility of the piping shall be achieved by a suitable layout configuration without the need for expansion joints, first. Expansion joints shall be used only where bends, offsets or expansion loops are not deemed feasible. In this case, the stiffness of expansion joint shall be considered in any flexibility analysis. And, the destabilizing effects of unbalanced pressure thrusts shall be accounted for in the piping design. 2) Expansion joints shall be used only with adequate guides and anchors and when the fluid plugging properties cannot make the expansion joint ineffective. 3) Bellows type expansion joints shall be avoided in services that cooking can occur. If a suitable piping configuration can not be designed to eliminate the joint, connections shall be provided to enable flushing of the area between bellows and liner to be carried out in a non-coking medium. 4) Torsional rotation of the bellows shall be avoided. This twisting generally produces extremely high shear stresses in the bellows so where torsional rotation cannot be avoided; special hardware shall be used to limit the amount of torsional shear stress in the bellows. 5) The maximum, minimum and installation temperatures shall be accurately stated in data sheet to be prepared by the designer. Where the ambient temperature can vary significantly during pipeline construction, pre-positioning of the Expansion Joint at installation may be required. 6) The Expansion joint manufacture shall be advised if the Expansion joint will be insulated and the manner by which the Expansion joint will be insulated in order to properly design the component parts. 7) The movements to be absorbed by the expansion joint shall include not only piping elongation or contraction, but also movement of attached vessels, anchors, etc. and the possibility of misalignment during installation. Unless included in the design requirements, misalignment of the Expansion joint shall be avoided. 8) Where movements are cyclic, the number of cycles expected shall be specified. As in the case of pressure, the movement specified shall be realistic. An excessive safety factor can result in an Expansion joint, which is unnecessarily flexible; thus its stability under pressure is unnecessarily reduced. 9) If the flowing medium can pack or solidify, provisions shall be made to prevent entrapment or solidification of the material in the convolutions, which could result in damage to the Expansion joint or pipe line. 10) The predicted amplitude and frequency of external mechanical vibrations to be imposed on the bellows, such as caused by reciprocating or pulsating machinery, shall be specified. A resonant condition in the bellows will result in a grossly reduced fatigue life and shall be avoided. 4.5. The flexibility analysis shall be in accordance with ASME B31.3 and shall be based upon the total displacement strain imposed upon piping system including the effects of equipment settlement or anchor movement, if applicable. 4.6.. The computed stress range shall be less than allowable stress range as defined in ASME B31.3 unless otherwise specified. 4.7. Thermal movements shall be limited to 300mm between anchors and to 100mm at pipe bends or turns. However, greater movements will be considered if the availability of space and the capacity of the anchorage to accept the incremental loads are confirmed. 4.8. Start-up, shut-down and steam-out where applicable and upset conditions including short-term excursions to higher temperature or pressure as well as normal operating conditions, shall be considered in flexibility analysis. This is particularly pertinent to loads applied to connecting equipment. The effect of vibration from machinery on connecting piping shall also be assessed. 4.9. Flare system piping shall be designed to take care of expansion, movement or vibration caused by the most severe operating or emergency conditions. Pipe shoes or saddles shall be furnished on the main flare header at all supports. 4.10. Cold spring shall be used as much as practical to reduce forces on equipment nozzles and to prevent interference from expanding lines. 4.11. The use of cold spring for piping systems, which connected to rotating equipment, is prohibited. 4.12. The combinations of the loads shall conform to the applicable piping code. 4.13. Impact loads caused pressure relief through a safety valve shall also be calculated in accordance With " API PR 520 ". 5.1.Each piping system shall be classified as grade “A”, “B” and “C” according to the severity of its design condition and need for special design. Each grade requires the following methods for stress analysis. Grade “A”: Judgment based on the experience of stress engineer. Grade “B”: The simplified method according to Para.319.4 of ASME B31.3. Grade “C”: Formal computer analysis. Process, regeneration and decoking lines to and from Fired Heaters and Steam Generators. Process lines to and from Blowers. Steam lines to and from Turbines. Suction and discharge line of Pumps. Suction and discharge line of Compressors. 5.3. The judgment of grade for all piping except that connected to rotating equipment shall be in accordance with the criteria shown on fig.1. 5.4. The judgment of grade for all piping connected to rotating equipment including air fin cooler and fired heater shall be in accordance with the criteria shown on fig.2. The allowable nozzle loads for rotating equipments shall be limited to those specified in their governing Engineering specifications and standards to which the equipment is designed, unless otherwise specified by applicable vendors. For ANSI and ISO pumps, allowable nozzle loads shall be those as other stated in table 2 of API 610 unless otherwise specified by vendors. The allowable nozzle loads for air fin cooled exchanger shall be limited to those specified in Engineering specifications and vendor recommendation and API 661. Piping to air fin cooled exchanger shall be designed to take into account clearances between the frame and the header box of each bundle. And, thrust blocks between tube bundles shall be used whenever possible to minimize friction loads at piping takeoffs and anchors, and to meet allowable loads at the nozzles. For piping connected to heat exchangers with T<400°C or P<35 kg/cm2g, the pipe bending stress due to thermal expansion at the exchanger nozzle shall be limited to 700 kg/cm2 using a rigid nozzle analysis. If above criteria is exceeded, localized stress at the nozzle-to-shell be calculated by WRC 107 and WRC 297, and these computed stress value shall be limited in accordance with ASME SECTION VIII. For piping connected to heat exchangers with T>400°C or P>35 kg/cm2g, the piping imposed loads shall be transmitted to the vendor for his approval. For piping connected to pressure vessels and columns with T<400°C or P<35 kg/cm2g, the pipe bending stress due to thermal expansion at the pressure vessels and columns nozzle shall be limited to 430 kg/cm2 using a rigid nozzle analysis. If above criteria is exceeded, WRC 107 and WRC 297 shall be used for calculate localized stress at the nozzle-to-shell, and these computed stress value shall be limited in accordance with ASME SECTION VIII. For piping connected to pressure vessels and columns with T>400°C or P>35 kg/cm2g, the piping imposed loads shall be transmitted to the vendor for his approval. The allowable nozzle loads and moments for fired heater shall be limited to those specified in relevant Engineering specification or API 560 or values that are acceptable to heater vendor. Displacement of tubes shall be approved by the heater vendor and the effect of expansion and/or displacement of the tubes shall be reflected in the stress analysis of piping system. Any heater designed with a floating coil (all spring or counter weight mounted) shall be provided with fail-safe limit stops in all directions. 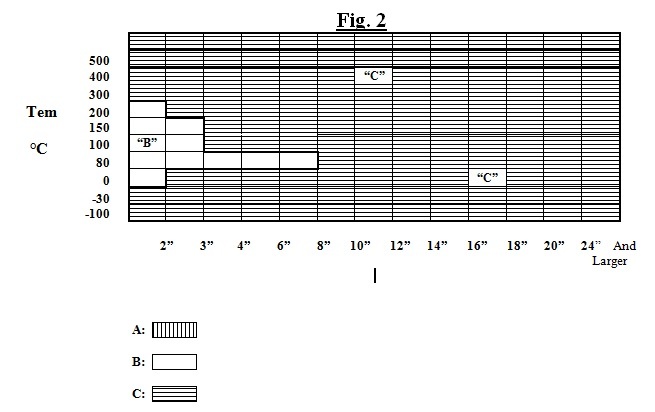 Computer analysis of piping systems connected to floating heater coils shall include the heater coil or an approximate model of the coil as part of systems and the effects of internal guides and restraints. Where heater coils are floating, the support of the connecting piping system shall be completely and independently balanced so that no dead loads imposed on coil. External load limits are to follow the vendor recommendations. 7.1. Pipe supports shall be spaced so as not to cause excessive deflection at any point along the unsupported section of the pipe. As a general guide for piping located in process area, the maximum mid span deflection shall not be allowed to exceed 12 mm and for piping in pipe way, the mid span deflection between straight run of piping shall not be allowed to exceed 12 mm. 7.2. The design, selection, fabrication and installation of piping support shall be in accordance with the “Engineering Specification for Piping Hanging and Support”. 7.3. Piping subjected to two-phase flow and connected to reciprocating compressor shall be supported as rigidly as possible while maintaining acceptability of pipe stresses and equipment nozzle loads. 7.4. For nonmetallic piping, vendor’s recommendation for flexibility analysis, support spacing and support type shall be utilized. Metric units (kg, mm, kg-m, kg/cm2) shall be used as a unit of control for analysis. CAESAR II Ver 4.2 (produced by COADE Inc.) will be used for formal computer analysis.